Son of a pagan father who converted on his death bed, and of Saint Monica, a devout Christian. Raised a Christian, he lost his faith in youth and led a wild life. Lived with a Carthaginian woman from the age of 15 through 30. Fathered a son whom he named Adeotadus, which means the gift of God. Taught rhetoric at Carthage and Milan, Italy. After investigating and experimenting with several philosophies, he became a Manichaean for several years; it taught of a great struggle between good and evil, and featured a lax moral code. A summation of his thinking at the time comes from his Confessions: "God, give me chastity and continence - but not just now." 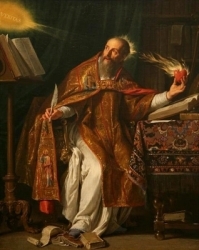 Augustine finally broke with the Manichaeans and was converted by the prayers of his mother and the help of Saint Ambrose of Milan, who baptized him. On the death of his mother he returned to Africa, sold his property, gave the proceeds to the poor, and founded a monastery. Monk. Priest. Preacher. Bishop of Hippo in 396. Founded religious communities. Fought Manichaeism, Donatism, Pelagianism and other heresies. Oversaw his church and his see during the fall of the Roman Empire to the Vandals. Doctor of the Church. His later thinking can also be summed up in a line from his writings: Our hearts were made for You, O Lord, and they are restless until they rest in you. Son of the farmer Robert Arrowsmith and Margery Gerard Arrowsmith. His rebel parents refused to attend Protestant services, harbored priests in their home, and at one point were arrested for their actions, and dragged away in the night, leaving the child Edmund alone. Entered Douai College in 1605; he was forced to quit due to ill health. Ordained in France in 1611. Worked among beleaguered English Catholics in Lancashire for 15 years. Even in those oppressive times he was known for his pleasant disposition, sincerity, and energy. Queen Elizabeth's governors and hierarchy lived on confiscated Catholic property, so public distrust of priests as agents of Catholic Spain working for a Spanish invasion, worked to their advantage, keeping the population in a constant state of paranoia, dependant on an intrusive government. To keep all this in place, Elizabeth had her own Inquisition. Edmund was arrested in 1622 for his faith, and spent his prison time arguing theology with the local Protestant bishop. Edmund was unexpectedly freed by a pardon issued by King James I. After making the Spiritual Exercises, Edmund entered the Jesuits in 1623, and returned to Lancashire for the remaining five years of his life. Betrayed by the son of the landlord of the Blue Anchor Inn in south Lancashire, he was arrested by priest hunters, and imprisoned for his vocation. He decided to let the court prove the charge rather than help them with a confession, replying, "Would that I were worthy of being a priest!" When the jury found him guilty of being a Jesuit priest, he exclaimed, "Thanks be to God!" Brought to execution, he prayed for everyone in the kingdom, then said, "Be witnesses with me that I die a constant Roman Catholic and for Christ's sake; let my death be an encouragement to your going forward in the Catholic religion." His confession on the day of his execution was heard by fellow-prisoner Saint John Southworth, and his final words were "Bone Jesu" (O good Jesus). Entered the Franciscan University at Palma, Spain at age 15, and joined the Order at age 17, taking the name Junipero after the friend of Saint Francis. 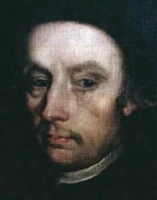 Ordained in 1737, and taught philosophy and theology at the Lullian University. In 1749, Serra was sent to the missionary territories of the west of North America. A mosquito bite he received early in his trip to the New World left one leg swollen; this and his asthma made walking a painful process for the rest of his life. In 1768 he took over missions in the Mexican provinces of Lower and Upper California, missions the Jesuits were forced to abandon by order of King Charles III. A tireless worker, Serra was largely responsible for the foundation and spread of the Church on the West Coast of the United States. Founded twenty-one missions, converted thousands of Native Americans, and trained many of them in European methods of agriculture, cattle husbandry, and crafts. Dedicated religious and missionary, penitent and austere in all areas of his life. Blessed Junipero Serra is the namesake of the Serra Club, an international Catholic organization dedicated to the promotion of vocations, and the support of seminarians and religious novices. Many of his letters and other writings have survived, and the diary of his travels to the west was published in the early 20th century. Prayerful hermit on a mountain near Sarsina, Italy; it has since been named Monte San Vicinio in his honour. As was the custom then, around the year 303 the clergy and laity of Sarsina gathered to select their bishop; they saw a sign appear in the heavens above the mountain where Vicinius lived (one account gives it as angels in prayer over his hermitage), a group of the faithful was dispatched to find the man pointed out to them, and Vicinio was chosen the first bishop of Sarsina. 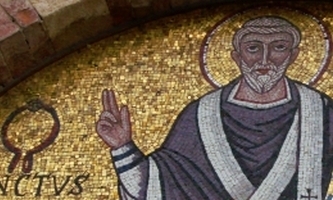 Vicinius served for over 25 years, spreading the faith to the entire region. Even as bishop he regularly returned to the mountains to make solitary spiritual retreats. Miracle worker, exorcist and healer of both physical and mental illness. As a personally imposed penance, for much of his life Vicinius wore an iron collar around his neck; it had a heavy stone attached by a chain. Healings he prayed for were especially powerful if the patient briefly wore the iron collar around his own neck. The collar has survived to today, and is still used for blessings of the sick, particularly those suffering from obsessions. Over the years a folk tradition developed of weaving collars of different coloured threads into “collars” as get-well wishes for the sick, and a reminder of the prayers for the intercession of Saint Vicinius; these collars, known as cordlens, are also blessed and given to the faithful during the celebration of the memorial on 28 August. Legand says that a beggar once tried to steal the collar and chain; he ran all night to escape the area only to find at dawn that he had been running in the same spot for hours; he threw the chain into the river where it floated until found by the locals and returned to its proper place. Discalced Carmelite friar, taking the name Alfons Maria of the Holy Spirit. Ordained in July 1916. Teacher and noted administrator. Professor at the Carmelite minor seminary. Prefect of the seminary. Prior of the Carmelite monastery at Czerna, Poland in 1930. Under his leadership, the house renewed their evangelization work in the community. Murdered by Nazis for being a Christian leader. Martyr. Married to the Spanish nobleman Theodore de Mas in 1799. Mother of nine children. Widowed in 1816. 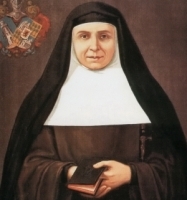 Founded the Institute of the Carmelite Sisters of Charity in 1826. The Institute spread through Catalonia with the mission of caring for the sick, and teaching children. Had a great devotion to the mystery of the Holy Trinity. Suffered a slow paralysis during the last four years of her life. Officer in the imperial Roman army, and a closet Christian. He retired from the army and fled to Auvergne, France during the persecutions of Diocletian. At one point he was hidden by Saint Ferreolus the Tribune. Julian later surrendered to pursuing Christian-hunters, and made a public announcement of his faith. Martyr. At least 80 French townships have some variant of his name. Born into slavery to an Egyptian official's family. An unruly thief, he was driven from the house and fell in with a band of robbers. On the run, he took refuge with hermits at the monastery of Petra in the desert of Skete, Egypt. He was converted and joined them as a monk. Priest. Possessed of supernatural gifts. A confirmed pacifist, he refused to defend himself with his monastery was attacked. Priest in the diocese of Verdun France. Dean of the Chapter of Ligny, Meuse, France. Imprisoned on a ship in the harbor of Rochefort, France and left to die during the anti-Catholic persecutions of the French Revolution. One of the Martyrs of the Hulks of Rochefort. Educated in England at Oxford and Gray's Inn. Converted to Catholicism. Studied and was ordained at Rheims, France, then returned to England to minister to covert Catholics during a period of persecution. For this crime he was martyred. Franciscan tertiary who worked as gardener and beggar for several Franciscan houses in southern Italy. Known for his personal piety, humility and deep prayer life, he was a much sought spiritual advisor. Reported to have levitated in ecstacy when hearing music that made him think of the heavenly choir. Raised a devout Catholic. Educated and ordained at Rheims, France in 1582. He returned to England to minister to covert Catholics in Yorkshire, for which ministry he was martyred. Wealthy freed Roman slave. Brother of Saint Theodora of Rome. Martyr. A catacomb in the Salesian Way bears his name. Protestant minister who converted to Catholicism. Studied for the priesthood at Rheims, France. Ordained in 1581. He then returned to England as a home missioner. Arrested and exiled for his work, he returned and was arrested in London. Condemned to death for the crime of priesthood. Martyr. Layman in the apostolic vicariate of England. Martyred in the persecutions of Queen Elizabeth I. 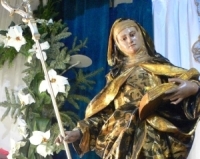 Sister of Saint Leander of Seville, Saint Fulgentius of Ecija and Saint Isidore of Seville. Orphaned young and raised by Saint Leander of Seville. Nun. Abbess. First bishop of Constantinople. Fought Arianism and turned away the writings of Arius from entering his diocese. Assisted at the Council of Nice. Married. Widow. Founded Buchau Abbey in Württemberg, Germany, entered it as a nun, and later served as its abbess. Boy martyred in the persecutions of Numerian. Bishop of Saintes, France. Protected his people during the Visigoth invasion. Priest in the apostolic vicariate of England. Martyred in the persecutions of Queen Elizabeth I. Martyred in the persecutions of Maximian Herculeaus. Martyred in the persecutions of Diocletian. Born a prince. When he was three days old, Rumwold was baptised, spoke a profession of his faith, and then died. Benedictine monk at Reichenau, Germany. Missionary preacher throughout northern Europe. Bishop of Schleswig, Denmark. One of the young women who travelled with and was martyred with Saint Ursula. Venerated at Cologne, Germany. Bishop of Carthage in North Africa. Bishop of Saintes, France for about 14 years.